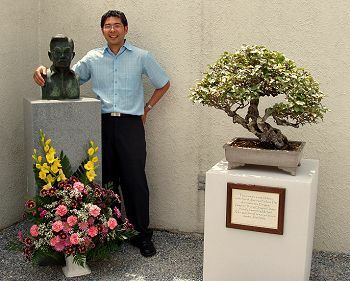 During the 2003 NBF board meeting, John mentioned that he'd like to donate one more tree to the John Y. Naka North American Pavilion of Bonsai – in his grandson Mike's name. 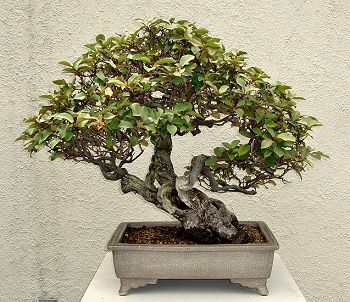 John had learned to love bonsai from his grandfather; Mike had learned the same thing from his grandfather. When John and Mike looked over John's collection, two very special trees stood out. Mike decided he wanted both trees to go to the Pavilion. As soon as a decision was made, I interviewed John about the histories of these trees in anticipation of their arrival in Washington D.C.; for this article, I'm sharing his recollections on his eleagnus. One of John's favorite places to go bonsai collecting in the late 1950s was the abandoned gardens of vacated homes before they were bulldozed to make way for the Golden State Freeway. Another bonsai – the “purloined pomegranate” – that John donated to the Pavilion years ago was also collected in that neighborhood. Once again, John's friend Mr. Koga accompanied John in search of a masterpiece. They teamed up to search and dig up the trees. They happened upon an incredible eleagnus, commonly known as silverberry. But only one person could take this beauty home. To decide who it would be, John spit in his palm, slapped the spit with his index and middle fingers of his other hand, and noted the direction of the flying spit. (Alice Naka confirms that this was always John's preferred method of resolving a dilemma.) The spit was flying John's way that day, and for the next forty-four years he enjoyed this masterpiece. John loved this tree. The trunk was substantial with a nice arrangement of branches. The interesting leaves were unlike any others in his garden, and their proportion to the trunk was appealing. John also appreciated the fragrant flowers and small berries. He immediately saw the future shape of this tree and knew that it would be one of his favorites. 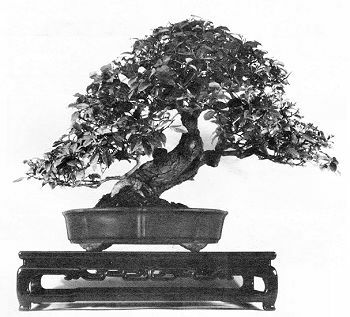 This eleagnus was featured in both of John's books on bonsai. In Bonsai Techniques I, it was planted in an oval, green-glazed, antique pot. As the tree developed, it outgrew the original container. 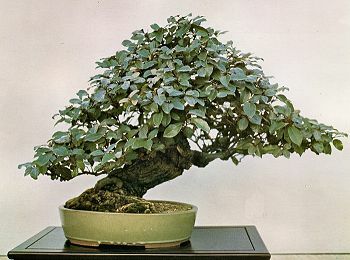 In Bonsai Techniques II, John showed how the tree was moved into a larger pot. That dark gray, unglazed, quince-flower-shaped pot was a perfect fit for the tree – at least for a while. Years later, John wasn't satisfied with merely changing the pot. He decided the tree needed a whole new look, so he turned it around and made the back the front. The new pot was a white, crackle-ware, rectangular pot with interesting feet. John pointed out that the current pot doesn't have to be the only pot. “Just like our clothes,” said John. “You may get tired of what you're wearing and want to change the style or color. Maybe you even go back to the original pot.” John loved to tell everyone that this tree had “two fronts and no back.” He could display it one way, then turn it around the next time for an entirely different look. In April of 2004, I took the two trees to my home to get them ready to ship to the Pavilion. On May 3rd, John came over to look at the trees one last time before they made their journey east. John, thrilled with the prospect of introducing his grandson to the bonsai museum, had planned to fly to Washington, D.C. with them – but it was not to be; John was hospitalized one week before Mike and I were to leave. Alice Naka insisted that Mike make the trip, saying “That's what grandpa would have wanted.” It was during our flight to Washington that John passed away. The celebration of this new donation was filled with sadness at the passing of our dear friend John. The eleagnus was displayed next to the bust of John, adorned with flowers; the display brought tears to our eyes. How sad indeed. But although John is no longer with us, he leaves behind a precious legacy of knowledge, laughter, and friendship. This is a revised and expanded version of an article that originally appeared in the NBF Bulletin. © 2007 Cheryl Manning. All rights reserved.